Edited by: Roger M. Blench, Fredeliza Campos. In collaboration with: Lily Beyer-Luglug, Tony Bongachon, Manuel Dulawan. The province of Ifugao is located in the north western part of Luzon Island in the Philippine Cordilleras. Ifugao is part of the largest and highest mountain range in the country. The municipalities surveyed during fieldwork were the following: Hungduan, Asipulo, Banaue, Kiangan, Hingyon, Lagawe und Mayoyao. 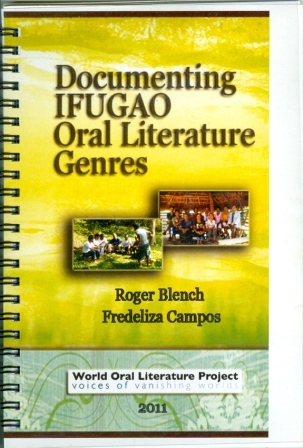 Ifugao is an Austronesian language that belongs to the Philippine languages which are a subgroup of the Malayo-Polynesian languages. It has around 186,000 speakers. The video footage presented here was collected between April and June, 2010 in four municipalities of the province. 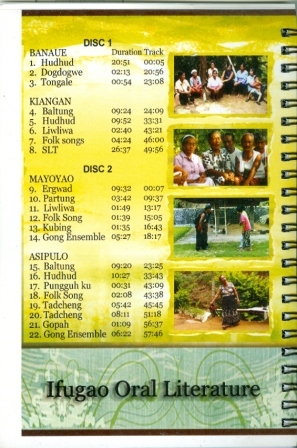 The two DVDs contain video recordings of different singings and musical instruments. The duration of both DVDs is more than two hours. 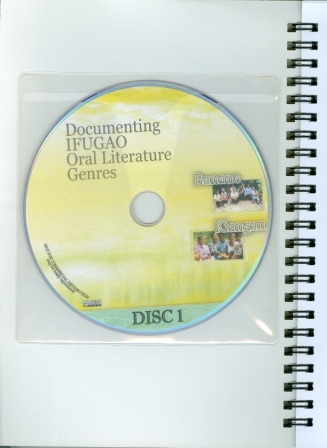 The corresponding booklet presents transcriptions and notes of selected songs. Furthermore, it contains information about traditional musical instruments. Following this link you will find more information on the large UNESCO project for preservation of cultural heritage in the Phillipine Cordilleras.